Spring is quickly coming to an end here in Maryland and you know what that means: heat and humidity. Before you know it, it will be almost unbearable to be outside. That is if you don’t have a shady spot to escape the sun, which is why you installed a Pergola last summer. These beautiful structures are not only a shady spot to sit back and relax, but they catch your eye, giving your landscape the focal point it needs. 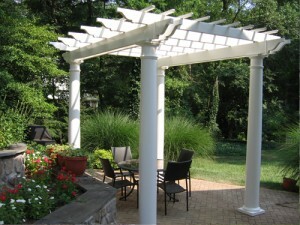 Unfortunately, depending on the position of the sun, your pergola may not always be the ideal place to escape the heat. The solution: Retractable Awnings. Your pergola may provide you with enough shade, but what happens when you want to enjoy the great outdoors and it starts to rain? After all, summertime rain storms can be pretty relaxing, but not when you are caught under the torrential downpour. This is where your awning can help. Simply extend the awning and relax under your pergola as the rain falls all around you. Adding a retractable awning to your existing pergola allows you to utilize your outdoor living space even more! In fact, experts estimate that adding rain and sun protection to an outdoor living space increases its usability by 400%. Retractable awnings are easy to operate, ensuring you have your shade when you need it. It’s truly a hassle free outdoors structure. Retractable awnings are available as manual or motorized operation. What could be easier? Retractable awnings for pergolas are very inexpensive, especially when compared to the increased functionality and usability they offer. Mid Atlantic Deck and Fence has been building and installing pergolas for our customers for several years. We also specialize in the installation of retractable awnings, allowing you to fully enjoy your beautiful pergola no matter the weather. If you have any questions about Retractable Awnings for your Pergola, please contact Mid Atlantic Deck & Fence (MAD Fence) today by clicking here or calling 1-800-833-9310. You can also follow us on Facebook and Twitter as well.